To be honest, I’m a bit shocked. I know it seems to be a bit of a stock answer to this question, but having browsed through all the previous COTM’s, I’m a bit surprised and humbled that mine has been picked to join the list. It was a complete surprise to get the email and a very nice one too. My name’s Chris and I’m, erm, forty. Yes I can hear the collective gasp of surprise (!). I live in a small village to the west of <? : prefix = st1 ns = "urn:schemas-microsoft-com:office:smarttags" />Gateshead with my partner Claire and three step kids (aged 19, 14 and 6). I also have two kids from my first marriage, Abbie who’s 13 and Cameron who’s 10 (some may have seen pics of Cam at some recent meets). To say life is hectic would be an understatement!! The work side of my life has me in Morpeth every day carrying out my duties as warehouse / stock manager, for a company who supply high pressure pipe and fittings to the oil and gas industry. I currently control over £3M worth of stock in the UK and Singapore. I had a 4 day visit to Singapore last autumn to oversee the movement of our stock - Quite an experience. I’ve been a lifelong supporter of Newcastle United, although I only get to a couple of games a season these days and I love to watch most sports. I used to play squash twice a week until a couple of years ago, when I smashed my heel bone into 5 pieces!! It’s never going to heal properly, so unfortunately I had to retire just as I was on the verge of making the Olympic team (yeah, right!!). 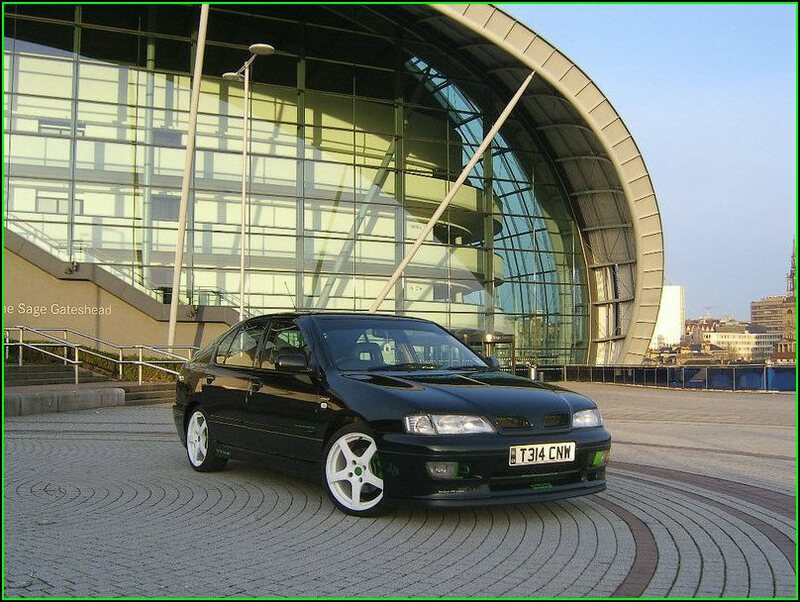 Amongst the number of jobs I’ve had, I worked for 8 years at Johnson Controls, next door to Nissan at Sunderland making the Primera front seats. I’ve also been a long distance heavy goods driver and worked as an import / export agent, traffic manager and ships agent. As a Nordic owner myself, I can feel comfortable asking this next question LOL! I’ve met you a few times now and you’re pretty fit! Not fit as in “fancy a shag on my back seat fit” but fit as in, you have some bulk and muscle definition. Do you work out, or do they put something in the water in Newcastle? 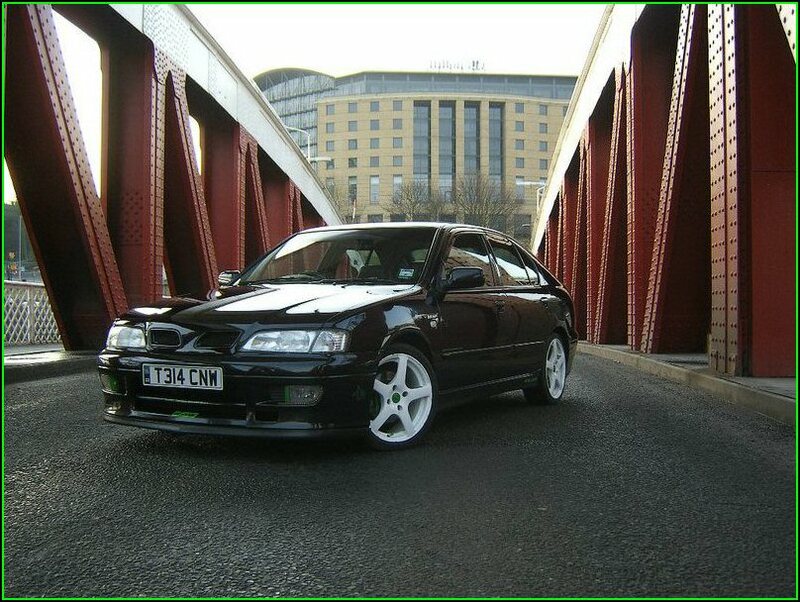 I stumbled across NPOC by googleising Nissan Primera GT after I bought mine. Simples! 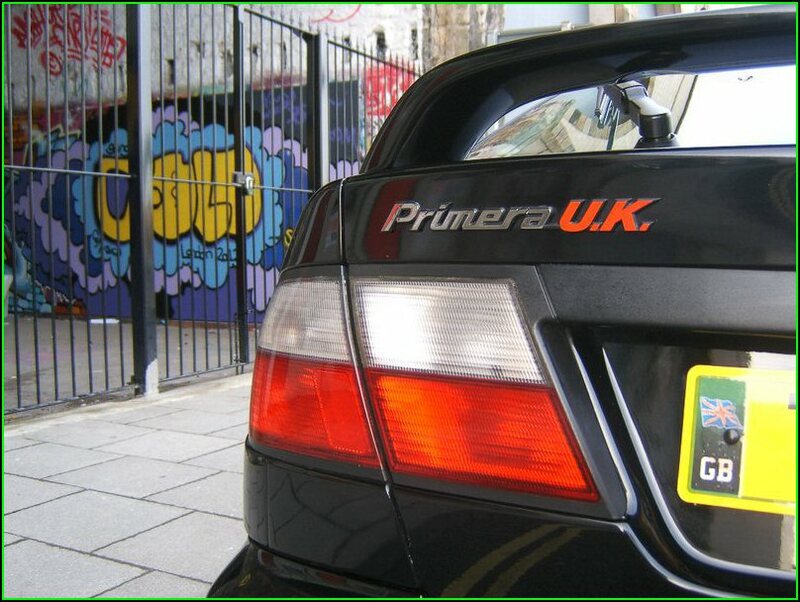 I’d thoroughly recommend NPOC to fellow Primera owners. The unrivalled database of knowledge is unbeatable. 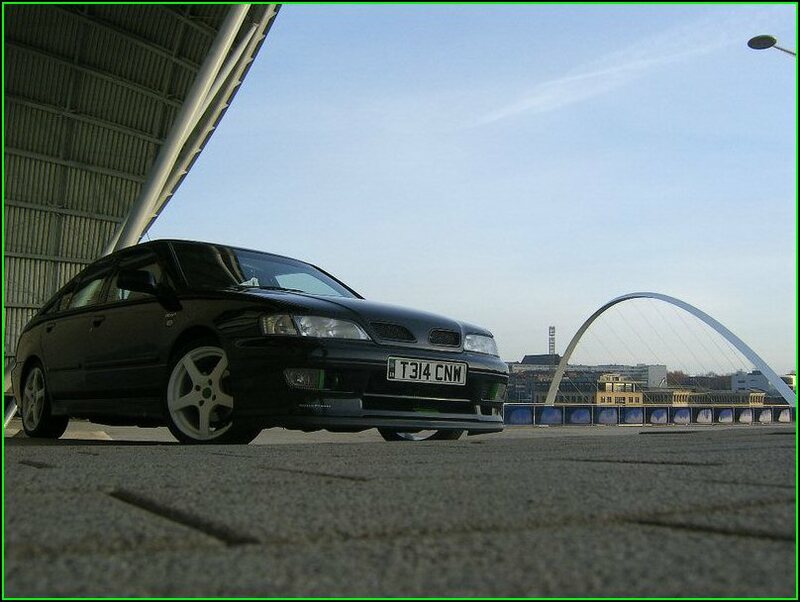 It doesn’t matter whether the Primera is bog standard or highly modified, the fact that it’s a Nissan Primera is all that matters. I think it says a lot that the NPOC has many active members who have stayed with the club, even though they don’t drive a Primera any more. Great community spirit and great friends! 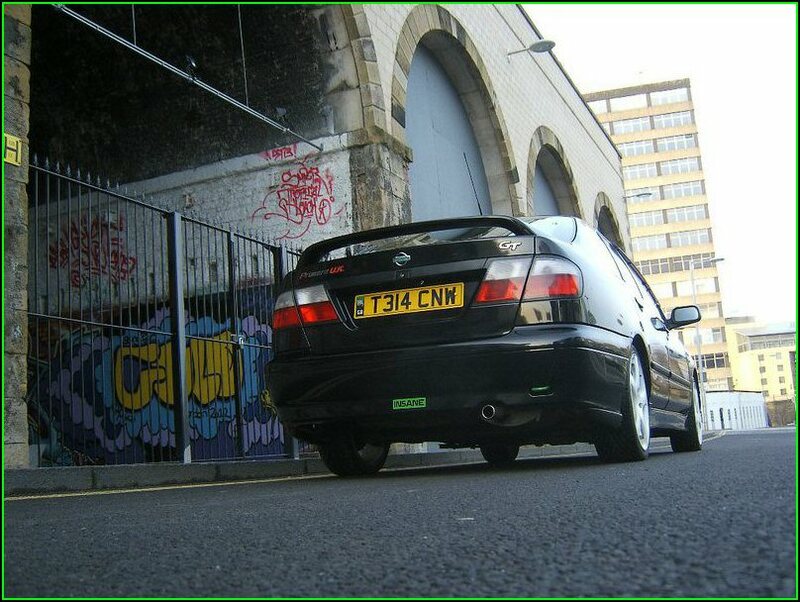 Is this your first time as part of a “car community”, or have you always been forums user? Absolutely the first time I’ve been a member of any forum, which actually surprises me considering how many cars I’ve had. I’m not very mechanically minded and I’ve never really had the modding bug until now, so I’ve never felt the need to join other forums. Speaking for myself, the reason I upgraded my membership to ‘Elite’ was simply that I wanted put a little bit more into the club. I recognised the dedication and hard work which the staff team put in and it’s just my small way of saying thanks. For members debating whether to upgrade to ‘Elite’, the benefits are worth a mention. From a personal email address, to discounted meet tickets, the free Ace breakfast in December and an exclusive ‘elite lounge’ to chill in, it’s definitely worth it! Your very 1st post on NPOC was: “I do have plans to improve it, just need the funds to do it! !” - 1 year on from that post, did you win the Lotto or something? I did say that didn’t I LOL!! Actually, before I said that, I seem to remember I had said that I hadn’t even thought about modifying the car until I saw NPOC!! To be honest, although it’s obvious I’ve done a lot to the car (it was totally standard when I got it), I haven’t spent big bucks in reality. Apart from the stainless steel manifold and the bodywork improvements, the only thing I’ve spent quite a bit on is the alloys. 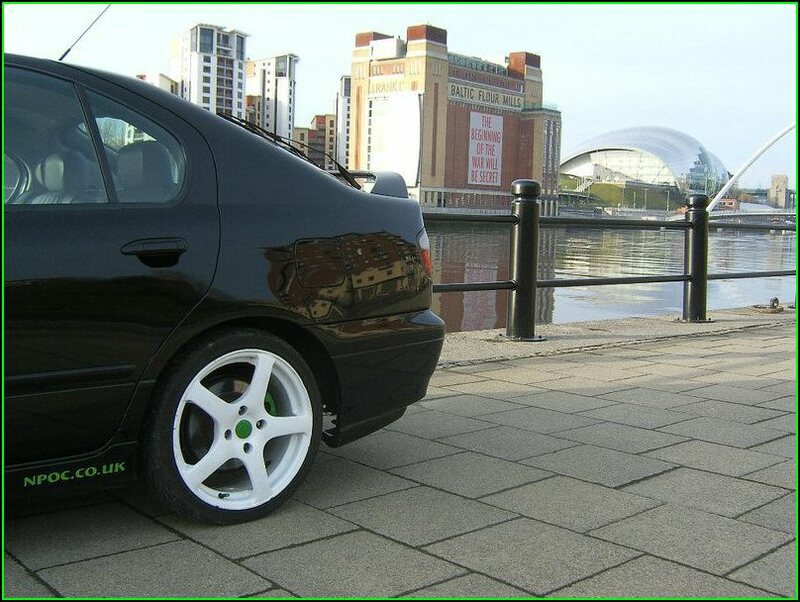 The white 5 spoke 17”s are back on now, having replaced the black 17” multi spokes (which I still have). 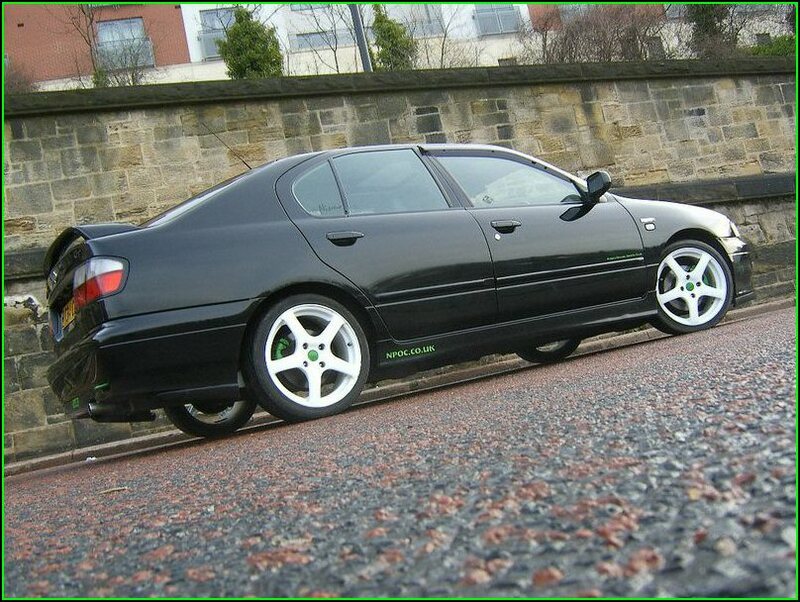 Previous to that I replaced the standard GT 15” rims with some Nissan Primera P11 144 Sport+ 16” alloys. 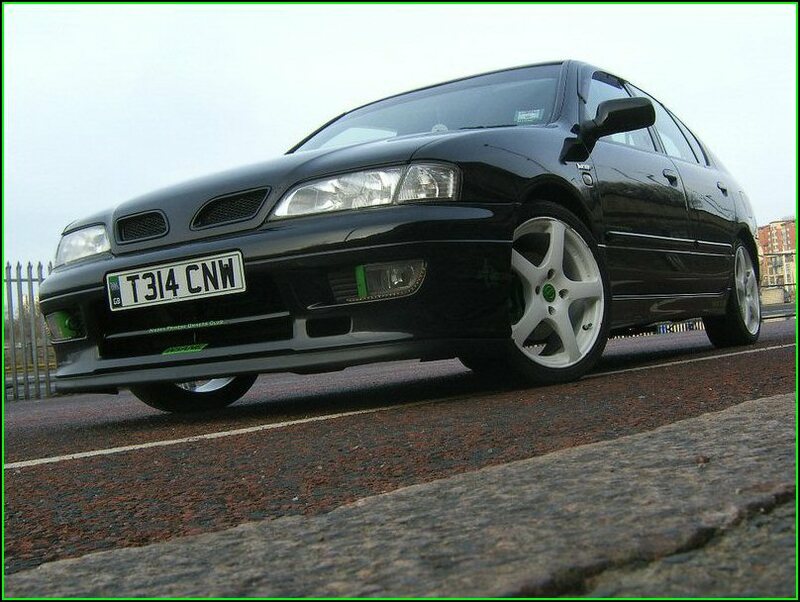 As you and all our regular readers should know, this is a back to back COTM win for the Black Primera P11 GT’s, in a very similar way to last months winner, you have a keen eye for small details when modifying, rather than shock and awe styleee! 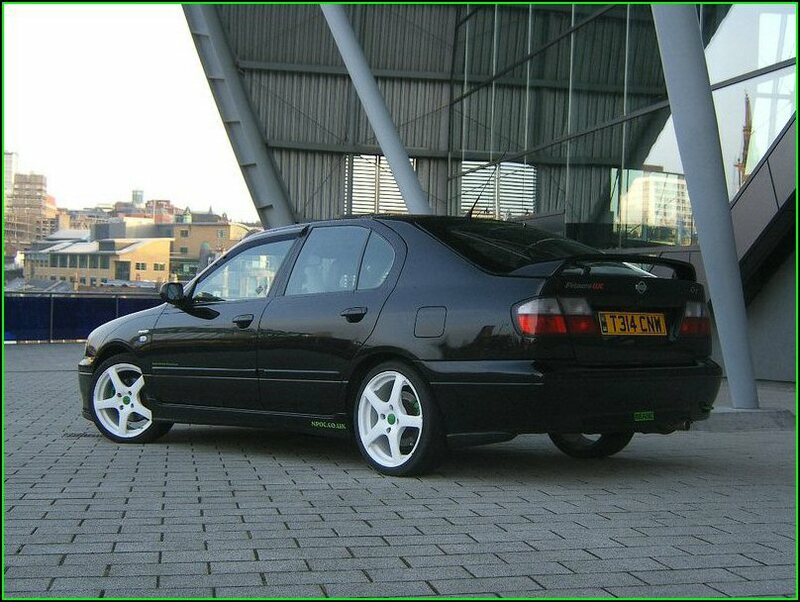 Is this a black car thing, or do you just prefer subtle changes and keeping the car clearly evident for what it is? I do have a keen eye for details, this is true, but it surprises me to hear you say my car is modified in a subtle way. The black and contrasting green theme, along with the white rims, means subtle is a word used rarely when describing my GT (especially when I applied the green headlight tint film last year LOL). I remember at my first meet, Ferry Meadows last year and I was talking to Di “Angel1”. I recall that there wasn’t the slightest hint of green on the car and I said to her that subtle was my plan. Five minutes later I spotted G and asked him for the silver NPOC stickers I had ordered. I noticed the green stickers while G shuffled through his wad and at that moment my theme was born, and the subtle plan was binned LOL. 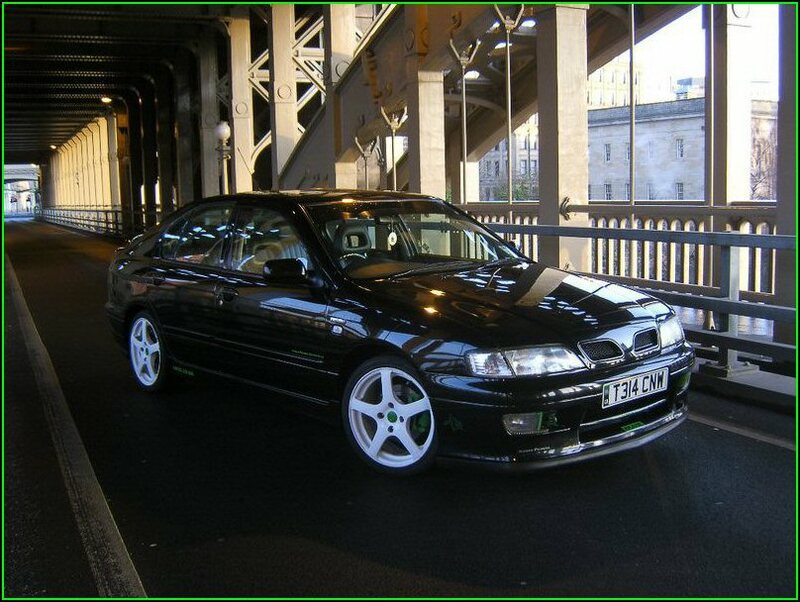 If you could repaint the car in any colour you wanted, would it stay black or would you choose a different colour? To be honest, I love the Kuro Black. It is truly stunning when it’s cleaned and polished. The problem is that by the time I’ve reached the end of the street, it looks like I’ve been rallying in it. 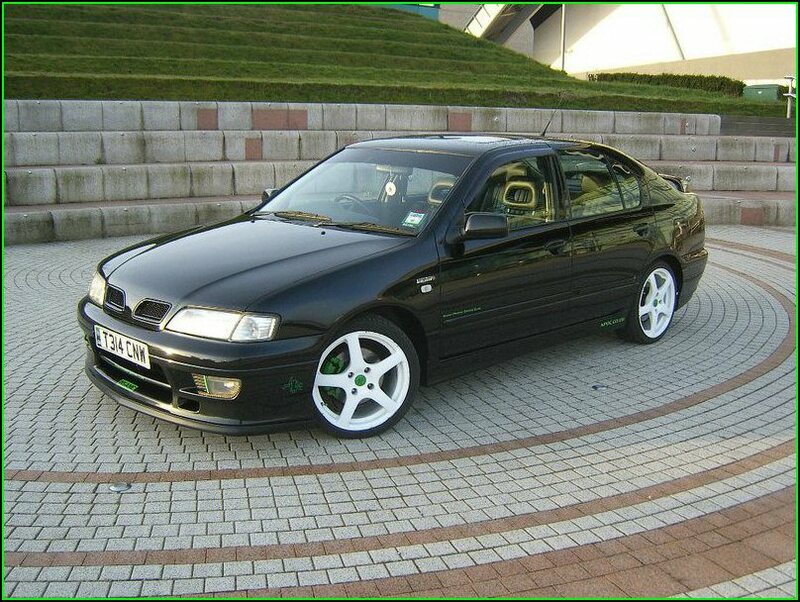 Although I think the Nissan Primera looks great in all the factory colours, I’d definitely keep it black. 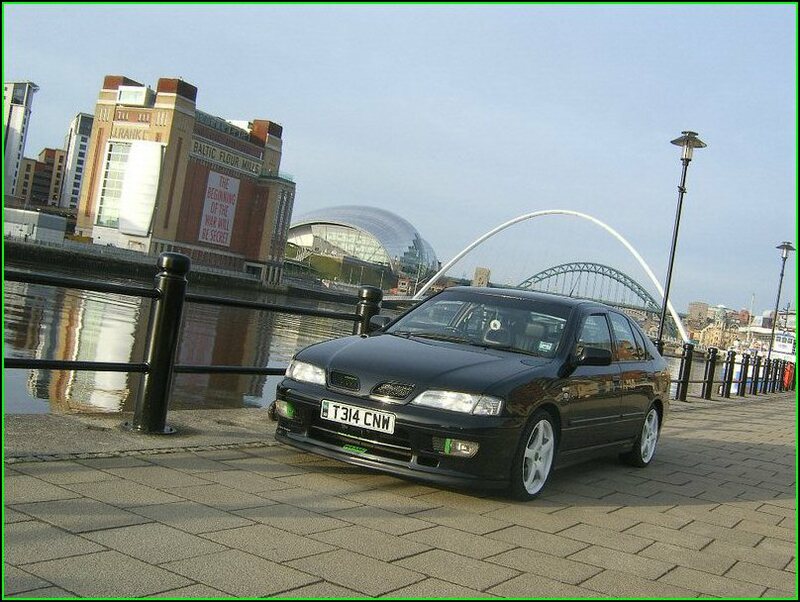 Is this your first Nissan Primera, or have there been any previous ones? 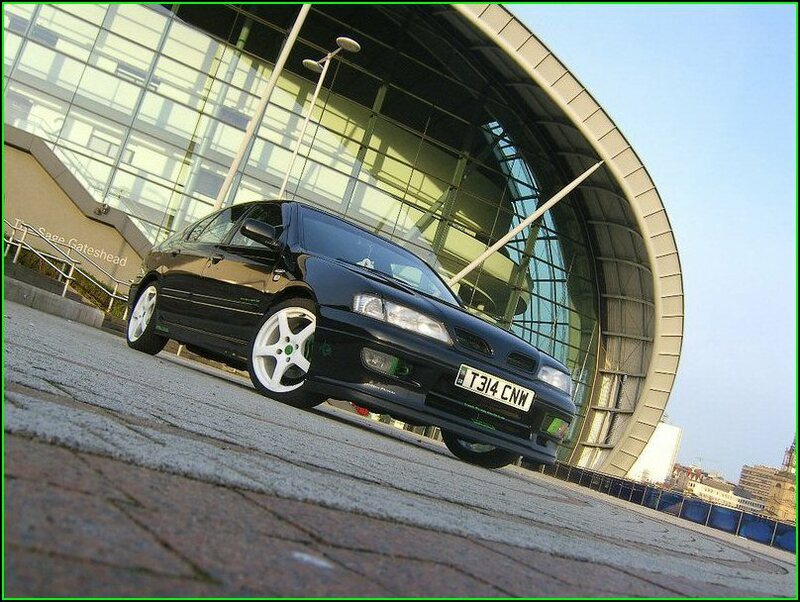 If it is your first Primera, what made you buy it and why? – Was it a car you wanted to own, or a spur of the moment purchase? 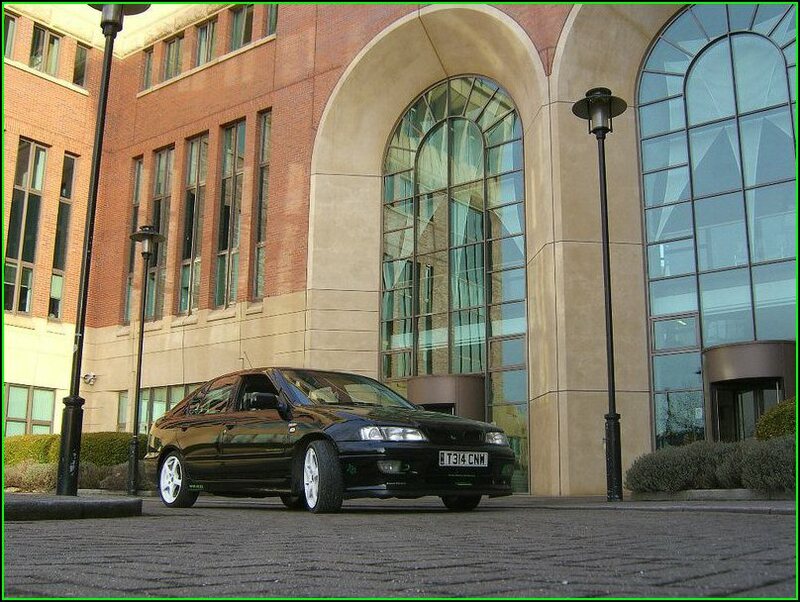 This is actually my second Primera. I had a ‘W’ plate P11 144 a few years ago in Silver. Although I’m no boy-racer, I found it a bit sedate and underpowered for me being a 1.6. When I was looking for a change early last year, I really fancied a GT. Throughout my eight years building the Primera seats, whenever the half-leathers came down the line, they had to be spot on as they were the ‘top of the range’ so to speak. That mindset had always given me the secret desire to own a GT one day. I searched for a good one and found this one down in Northampton. Having spoken at length to the garage, who confirmed the cars faultless history, I felt confident enough to travel down to see it. Claire and I drove down, did the deal and I smiled all the way back up to Newcastle. 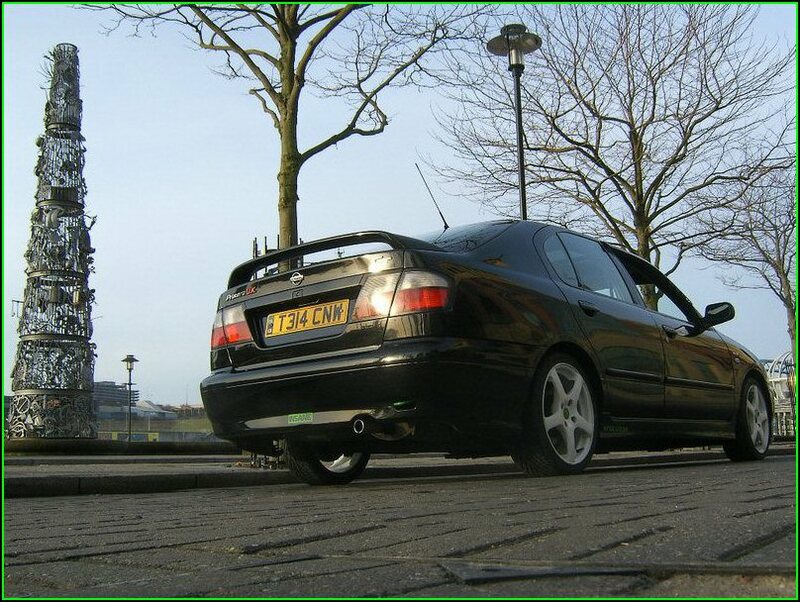 We know you have another Nissan on the drive as well (Nissan Sunny ZX Coupe). I guess you have Nissan blood running through your veins?!? It must be a hard decision to make, about which car you are going to spend money on, how do you pick? Ha ha, you may be right about Nissan blood. Of the 35+ cars I’ve owned, I’ve had 10 Nissans – 3 Micras, 2 Stanzas, 1 Bluebird, 2 Sunnys and 2 Primeras. I’ve tried most manufacturers but always end up back with a Nissan. At the minute, it really isn’t difficult to decide which car to spend the money on – I don’t have any to spend!!! If Gordon Blair made it compulsory for all of us to only own 1 car, which one would you keep? That’s a tough one. I love the cool retro styling of the coupe, it sounds great with it’s cone air filter and stainless manifold and full exhaust and actually has 30K less miles on the clock than the P11 GT, I love the fact that it turns heads because very few people have actually seen one……. BUT, I’d have to keep the GT (Just as well the coupe is parked up at work and couldn’t hear that last answer LOL). I’ve probably forgotten something but at the minute that’s all I can remember LOL. That’s a tough one. The only thing I have done to improve performance is the stainless manifold. I must admit though, I love the difference it makes. 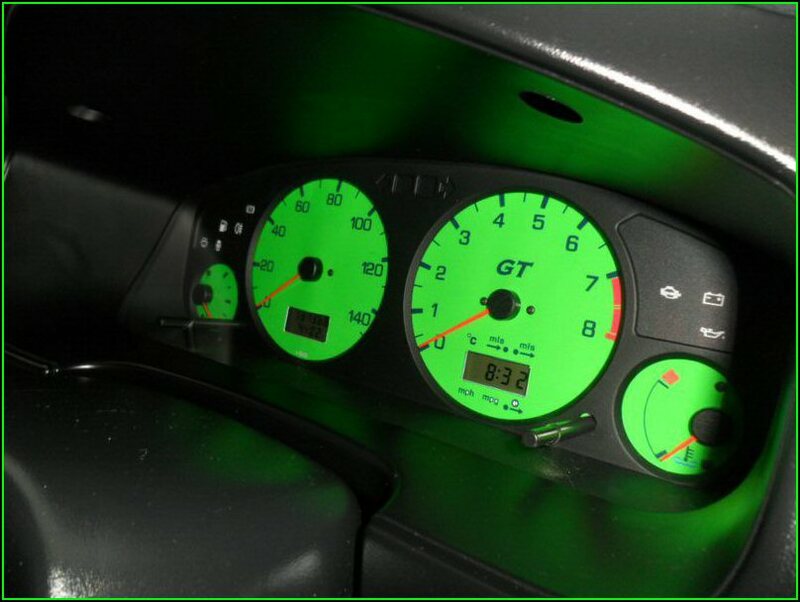 Cosmetically I love the lowered stance and white rims and my green LED immobiliser unit (thanks Shaun), but overall my favourite mod has to be the made to order green dash dials. I totally love them in daylight, but they come alive at night. A big thanks to “Primera Dave” for making them for me. Well, I’ve changed the alloys four times in the last year, so I reckon I’m a bit of a wheel addict. 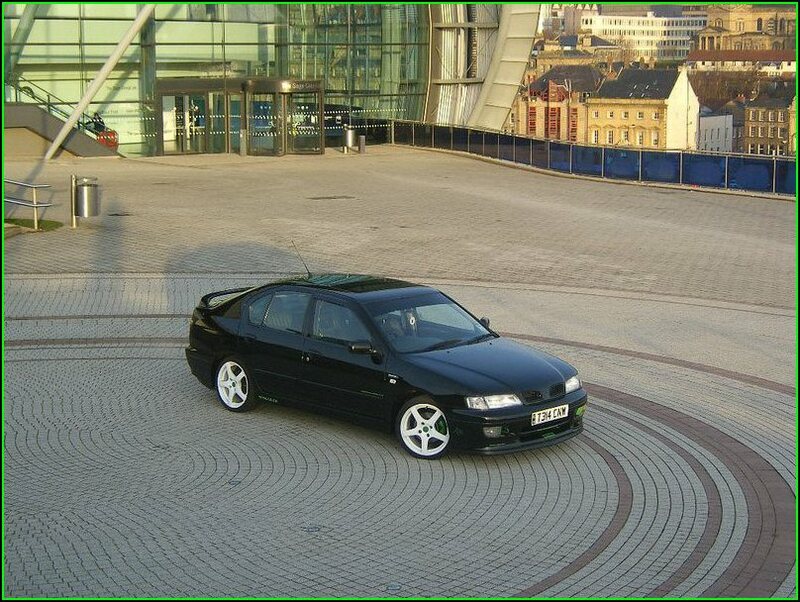 I’d be considering some wheels maybe? A full stainless exhaust system would also be nice. Any squirrels on the horizon that you wanna leak out, or are you keeping zipped for a Japfest reveal? 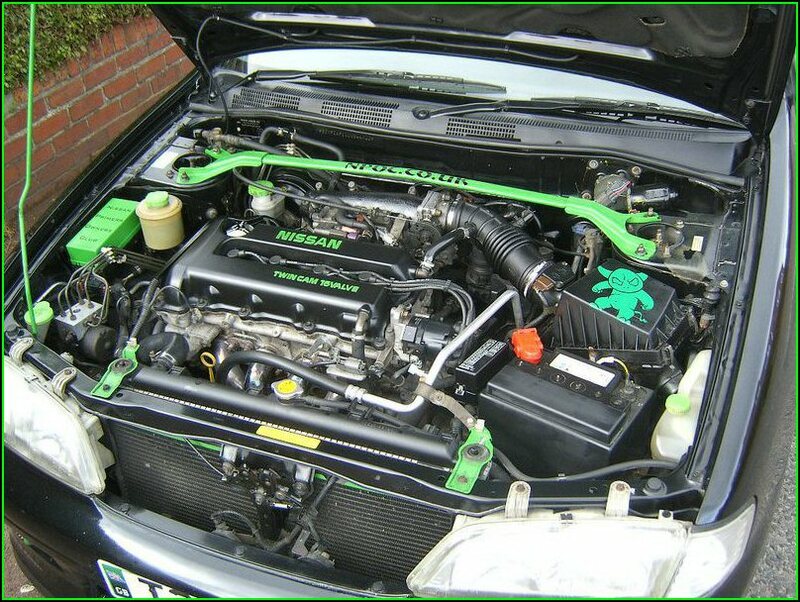 Maybe a few small cosmetic changes or additions (what a surprise LOL) under the bonnet, but nowt major for now. I’m really pleased with how the GT is looking at the minute and don’t want to mess too much. I’d love HID’s sometime soon though. Middlesbrough or Sunderland? – Don’t be daft!! Tell us your favourite NPOC car? 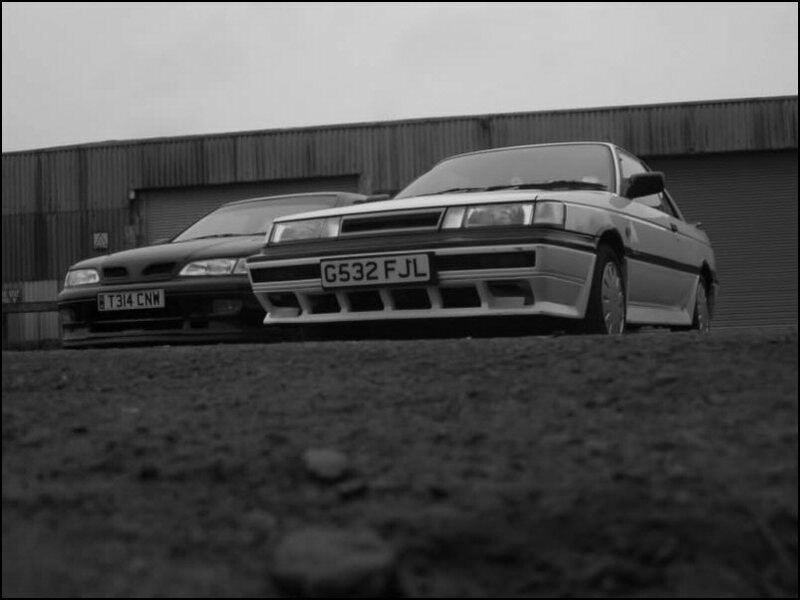 – We all know there’s some fantastic Nissan Primeras in this club. Among my favourites are Martin’s “prim-n-proper” P10 eGT, last months COTM “Quaily”’s GT, “Taffy” and “Supertourer” brotherly GT’s, and “Tom-P10”’s sadly departed ‘Purple Dragon’. However, I reckon my absolute favourite has to be Matt’s “Blue” Black P11 GT saloon (“Nabber”’s old one). What a stunner!! We’ve seen you venture out to a lot of Club Meets, in your first year as a member. What’s been your most enjoyable Club Meet here and why? I’ve been to some great meets, both regionals and nationals. I reckon Ace Café in December tops the list. A great drive down in the GT and such a cool location. I got to put faces to usernames (wished I hadn’t with some! LOL). A special mention for the Ace breakfast too. It’s worth the 500 mile round trip alone! And thanks to the NPOC Club Owners, it’s free to ‘Elite’ members - Which makes it taste even better! The meets are a great way of re-enforcing the fact that NPOC is about the people first, cars second. There’s always a great ‘feel’ to the meets, with plenty of laughs, help and advice, as well as the great cars to admire. To any new members thinking of attending a meet, get yourself along. You’ll be made to feel welcome and valued. My first meet was a big national meet (Ferry Meadows 2009) and I was quite nervous to begin with. I started off with my camera in hand (as usual), snapping away quietly as I didn’t know anyone; however, I was quickly welcomed into the fold and thoroughly enjoyed the day. We will be taking your Japfest virginity in May 2010, are you looking forward to this event? I can’t wait for my first Japfest. It will be great to see all those great Nissan Primeras on the club stand - Truly impressive! More importantly though, it’ll be great to meet some of the members I haven’t yet bumped into. I’m staying over on the Saturday night (sharing a room with Tom and Sheepy Gaz), so I reckon a good night out is inevitable!! Brands have returned in their numbers recently (Mini, Beetle, Fiat 500, Scirocco etc). All seem to have had success, as there is a following already there. Whether it’s dads telling their kids how good the old car was, or previous owners of the marquee. Certain old brands / names, carry a love and a loyalty which never goes. 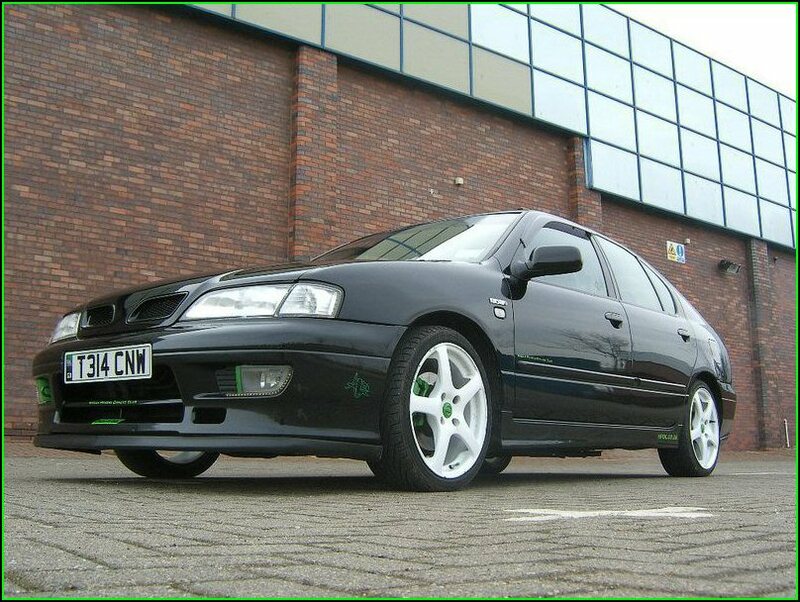 If the Nissan Primera brand was re-ignited, I’d certainly have a serious look at it (and then realise I couldn’t afford it LOL). Some of our members might be aware that you came up with the idea for the official NPOC Air Fresheners. Tell us more. I thought they seemed to be a good way to get the clubs name out and about, while at the same time being useful and easy to post and distribute. Behind the scenes was a bit frenetic, as we had a limited time before the Ace Café Meet to organise the manufacturer, design, scent, samples, delivery to me and then delivery to the club. Shaun will remember what seemed like hundreds of emails to the printers chasing deadlines and negotiating the price down. Anyway, it all came together in the end with a couple of days to spare if I remember correctly and I’m really happy that the final product seems to have the members approval. 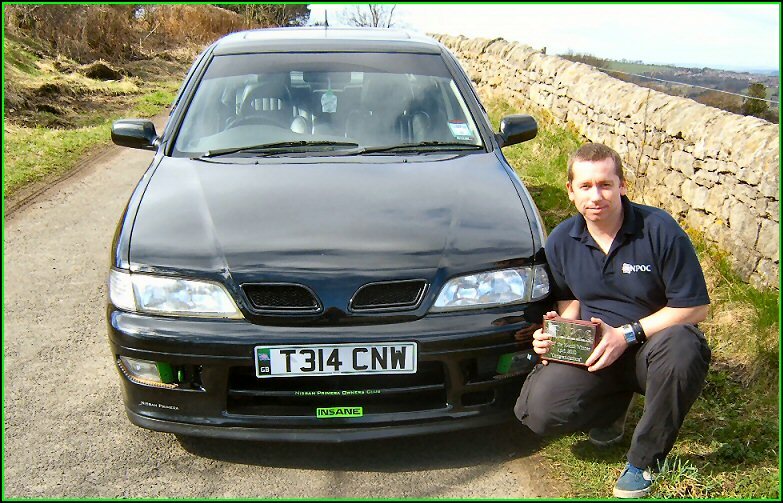 Many thanks for telling us all about yourself and your awesome Nissan Primera P11 GT Chris - Congratulations once again for winning Car Of The Month for April 2010, it was a very easy decision to make! Please pick up that pen and sign off the feature in your very own words and be sure to give a shout out to all and anyone, who helped you get here today. Firstly, a special thanks to Claire my partner. Although she doesn’t ‘get’ the whole car forum thing, she’s been understanding, tolerant and generous with our spare cash. The kids have also been great. Next, thanks to a few of the members who’ve really helped me with the GT. Dave “Rodney” has been a star, always available for advice and he’s done a load of the bigger modifications on the car himself - Cheers mate. Big thanks also to “Stony” for refurbing my rear calipers during a snow storm in December, that was a funny old day! Paul “Quaily” for helping me out and offering advice right from my first attempts at posting pictures on the forum. The guys who see me as a bit of a ‘Photo Whore’ are probably cursing that I ever got that advice LOL - It’s all Pauls fault!! There are far too many members to mention here who I now consider ‘friends’. It’s a long list, but you know who you are. Thanks to Shaun and the team for the backing and help I received during the frantic weeks leading up to Ace Café 2009, trying to ensure the NPOC air fresheners were manufactured and delivered. Thanks also to the Staff Team for keeping us eejits in check and for making NPOC a great place to spend time!